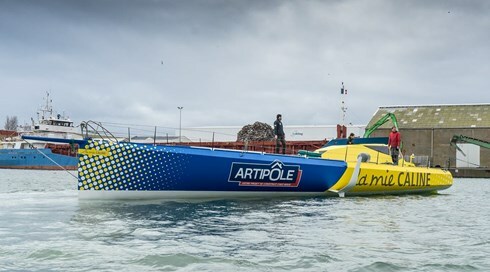 Arnaud Boissieres's IMOCA 60 La Mie Caline-Artipole (ex Ecover3/Gamesa) hits the water in Les Sables D'Olonnes after a winter in the shed 'under the knife' with Mich Desj's Mer Agitee team. More sailing photos will be posted on our Facebook page here, as they become available. Meanwhile ex Acciona is now in the hands of Jörg Riechers and Robert Stanjek of Offshore Team Germany. Well almost, she’s at Lisbon yard Trimarine and has also been under the knife with Owen Clarke working on a new ballast tank arrangement for 2018, optimised for and ahead of a new foil design to be developed for 2019.